In 2013, RCC in cooperation with UQ's School of IT and Electrical Engineering (ITEE), launched QURPA (Queensland Undergraduate Research Projects Abroad). QURPA was based on Monash University's MURPA program. Over the past five years, Monash University IT honours students have travelled to international partners at the University of California, San Diego (UCSD), The National Center for Supercomputing Research in Illinois, The Technion in Israel and the University of Warwick. Students are placed for a period of eight weeks, allowing them to integrate into the research groups as team members. Students have a local mentor in Australia as well as one in the remote site, and often bridge international research projects. Projects span a range of advanced computing technologies, and serve as incubators for RCC projects. In 2013, UQ IT students joined Monash students for the first time. This not only allowed UQ students to engage in some fascinating advanced computing projects, but opened the door to transnational student-led collaboration in undergraduate research. In addition to projects at UCSD, QURPA also has collaborators at the Institute for Infocomm Research (I2R) in Singapore. Students for QURPA are selected each year. Read their trip reports (linked under the QURPA menu). If you are a UQ student interested in pursuing this unique opportunity, please contact RCC Director Professor David Abramson (david.abramson@uq.edu.au) at your earliest convenience. Students will be selected on their academic ranking, and receive travel and living support across the eight weeks. Please note: these research internships are intended for UQ IT/Multimedia students going on to honours next year or Software Engineering students entering their final year. 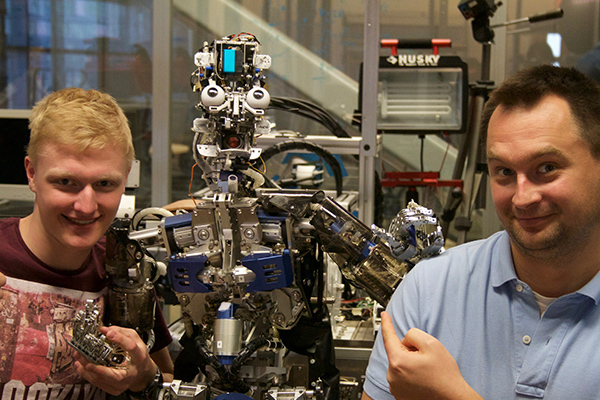 2016's QURPA-funded engineering student Josh Riddell (left) and TDLC-sponsored UQ PhD student Nikodem Rybak (right) with a new friend at the University of California, San Diego. TDLC is the UCSD's Temporal Dynamics of Learning Center.